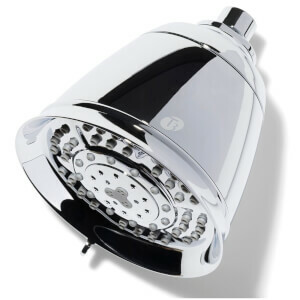 The T3 Source Handheld Showerhead transforms your haircare regime by eliminating toxins from your water supply for fresher, healthier-looking locks. Say goodbye to dry, damaged hair and hello soft, touchable tresses with this advanced water filtration system. The first step in any hair care routine is washing. Household water supplies often contain a high level of chlorine, which over time causes damage, dullness and frizz. Harnessing advanced technology with a patented chemical filtration process known as “Redox”, the T3 Source Shower uses a complex blend of tourmaline, calcium, zinc and copper to transform chlorine into harmless elements that are too large to be absorbed by hair or skin. Removing up to 95% of chlorine from shower water, it results in hair looking sleeker and healthier, with enhanced shine and manageability. Skin also benefits with improved hydration levels. The filter is recommended for replacement every 3-4 months or when the colour indicator turns black.